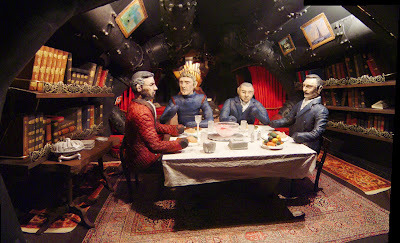 This blog is here to document my latest 2009 project, an extensive recreation of the Disney 1954 movie 20,000 Leagues Under The Sea through a series of detailed miniature dioramas, all contained under my model railroad table. This will be a "crawl-thru" type attraction (What is a crawl-thru? Read about it here). Like Disney, I usually tend to keep everything under-wraps until I unveil the final product at the end. 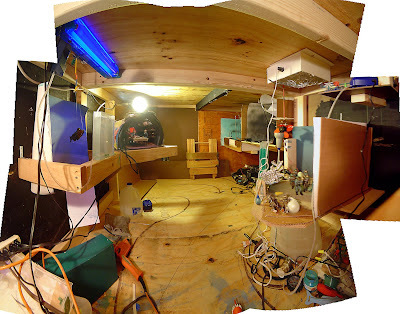 However, by keeping everything a secret, I end up not taking any photos of my projects and it is often disappointing to not have any documentation in the end showing how everything worked and was constructed. This time, however, I will document every step in the process of the creation of the project with photos and drawings (and maybe some video) illustrating each leg of the construction. Even though the posts here will be chock-full of spoilers, it will show the amount of work that goes into this and other projects--which is often under-appreciated. This blog includes weekly updates that consisted of notes, ideas, photos, and maybe some video of what was worked on each week up until the estimated completion date of December 2009. (It was officially finished on December 10th, 2009). Inside the set, all of the figures are painted and complete--except for their hands. Those are going to be molded off action figures since I really don't want to make a bunch of hands. The table has more details like the food on their plate (which I made up since you can't see the food in the movie). Pictures have been added to the pipes above, made up photographs that I printed off. Mainly it's Monet stuff and sailboats, but I threw in my riverboat painting that I did for fun. Also included towards the back is a picture of ghost from the Haunted Mansion, as a nod to what was in this space before the 20k project took over. Small things like jars and utensils will have to wait to be added later on, but not at this time. Moving onto another scene finally, I completed one entire scene in 2 days!Mainly that happened because it was a fairly easy scene to and the hardest part was already done. Before I get to the scene, I'm just going to briefly mention how this scene came about, since it wasn't even planned to be made from the beginning. Looking at the planning post with the diagram in it, you will notice two spots, labeled as D and H. Spot D is where the dinner scene is now, and spot H is where the Divers/Shark attack scene would go. When I was planning the Divers/shark attack scene, I was originally going to use a larger scale of divers, larger than what I was using for the burial scene. After working on the burial scene, I decided to use those same divers for practicality reasons and not use a larger scale. So the scene ended up being smaller than what was planned. Same thing happened with the dinner scene--it came out smaller than planned. By having these two scenes shrink in size, I was left with a gap between them--enough for another scene. But after I thought about it, I decided to have more variety in my scenes and I scrapped the idea to have a this third underwater/diver scene. I realized that none of my planned sets show the entire Nautilus and I thought that should be something that should seen, especially for someone who has never seen 20,000 Leagues before. A classic shot of the Nautilus cruising underwater would be ideal. Since I already had a resin Nautilus model all ready to go, this was an easy scene to make, and since the scene is so shallow, it fits in that gap space perfectly. This scene is suppose to represent the Nautilus approaching the Island of Crespo, where the underwater hunting expedition takes place. I also decided to do this entire set in blacklight paint, which looks really good in small spaces (The Fantasyland dark rides at Disneyland are good example of using blacklight to make a small space look bigger) instead of incandescent lights. Another reason for using blacklight is that it makes it easier to put "lights" on my Nautilus model, which I don't want to destroy by drilling holes in it. Then I painted my Nautilus model (which is only about 10" long) with a dark brown (which doesn't glow) and then I drybrushed it with blacklight paint for the highlights coming from the surface of the ocean. Then for the "lights" I painted the windows with yellow blacklight paint. I suspended the model from the ceiling with extremely fine thread, which is invisible in the dark; so invisible you couldn't even see it even if you were looking for it! The model is rigged from bow and stern by one thread that is hooked at the top. Another thread attached to the middle of the model acts as a "safety cable" if the thread holding the model from the ends where to snap for whatever reason. Two stabilizer threads keep the model from rocking back and forth if it gets knocked. Once I was satisfied with the paint job, I installed another one of my trusty "bubble boxes" from my old Submarine Voyage, as used on my burial scene. I dyed the water and added a drop of paint to the water to create "murkiness". So with that done, I will now transition into my next scene! The scene would have an animated shark dive towards the Conseil and Ned figures (with their arms in the air) and Aronnax and Nemo with his gun standing by. As the shark dives, the Nemo figure would lift his gun and "shoot the shark" by a flashing LED light. After some thought, this scene would be tricky to do, considering the space that I would be working in. Composition would be hard to figure also, since I want the scene to look good artistically in it's layout. It's also going to be a challenge to not make the shark look stupid when it dives--because it's on a wheel, it goes back up and having a shark go straight up in the air looks ridiculous. At this point, it's going to be a careful matter of placing the Shark wheel at the right angle and height. At this point, all I've done on this scene is do some blocking out, not much construction which I'll get into next post. Planned to be completed by the coming winter, a major "crawl-through attraction" is being built under a large 12' X 5' table themed to the Disney Classic movie 20,000 Leagues under the Sea. Although the content isn’t exactly original, compositions of the scenes and the execution of the presentation of the project will be completely original. It will done in a way as if it were a small attraction at a Disney park. But hasn't a 20,000 Leagues Under the Sea attraction already been done? Yes... but of all the various attraction incarnations of the movie in the Disney parks around the world, none of them actually tell the story of 20,000 Leagues Under the Sea which will be my intent. The presentation will be very similar to that of the windows on Disneyland's Main Street and the Sleeping Beauty Castle Walk-through where key and memorable scenes are represented through miniatures and dioramas-- all put together to tell a story.